VIMANA YOGA IS A FOUNDATIONAL, THERAPEUTIC CLASS FOR ALL LEVELS THAT INCLUDES TRADITIONAL HATHA YOGA, CORE, FLOW, AND DYNAMIC MOVEMENT WITH BREATH. VIMANA YOGA COMBINES SEVERAL STYLES OF YOGA INCLUDING BIKRAM, FORREST, PARA, ASHTANGA, AND VINYASA YOGA. THESE COMBINATIONS PREPARE YOU FOR ALL STYLES OF PRACTICE. VIMANA FUSION IS AN INTERMEDIATE CLASS FOR ALL LEVELS. WE DESIGNED THIS PRACTICE TO BRING OUT THE BEST PARTS OF A THERAPEUTIC CLASS WHILE STILL CHALLENGING US TO BE PREPARED FOR EVERYTHING LIFE BRINGS US. THIS EXPANSIVE PRACTICE COMBINES ELEMENTS OF TRADITIONAL HATHA, FORREST, PARA, GHOSH, AND VINYASA YOGA. VIMANA FUSION TEACHES YOU HOW YOUR FAVORITE POSTURE CAN FLOW, BRINGING GREATER DEPTH AND STABILITY, BY EXPLORING LONGER SEQUENCES, PRANAYAMA, AND MEDITATION TECHNIQUES THAT WILL GIVE YOU THE CLARITY TO SET AN INTENTION AND REALIZE YOUR DREAMS. 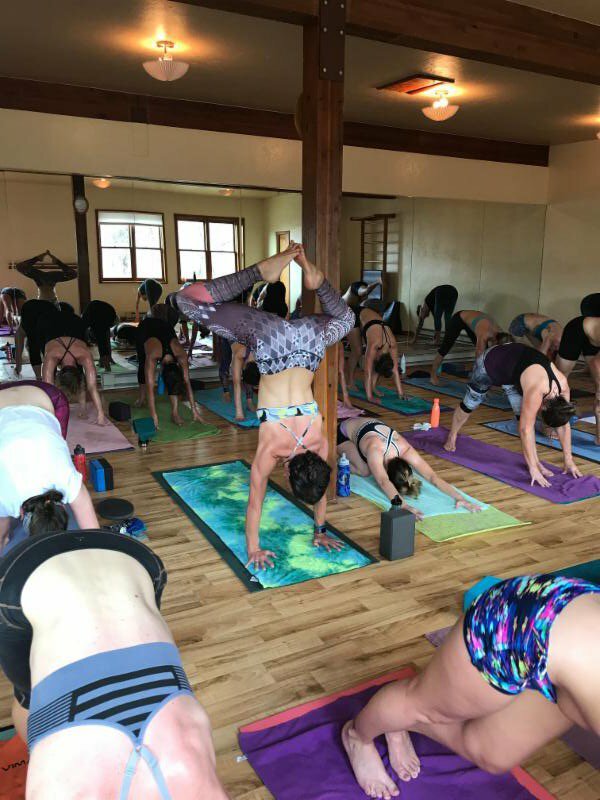 VIMANA FLOW IS A FUN, ALIGNMENT BASED FLOW CLASS DESIGNED FOR ALL LEVELS. THIS CLASS COMBINES VIMANA, VINYASA, PARA, AND FORREST YOGA, TO CULTIVATE AN UNSURPASSED EXPERIENCE. YOU WILL FEEL STRONG, SUPPLE, BALANCED, ENLIVENED, AND NURTURED. VIMANA HOT STRETCH IS A RESTORATIVE, GENTLE FLOW PRACTICE, THAT HAS A STRONG MOON QUALITY. YOU WILL SEE THIS IN THE PACING, AND MORE FORWARD BENDS, ASYMMETRY, ATTENTION TO ALIGNMENT, LONGER HOLDS, AND AWARENESS OF BREATH. THIS PRACTICE WILL BRING IN A STEADINESS THAT HELPS YOU TO TAP INTO YOUR SUBCONSCIOUS, ALLOWING YOU TO RELEASE STRESS, AND DEEP HELD PATTERNING BY RESETTING YOUR PARASYMPATHETIC NERVOUS SYSTEM. WE FOCUS ON STRETCHING HIPS, SHOULDERS, NECK AND ARMS WITH MINIMAL USE OF THE ARMS. THE ELEMENTS INCLUDED IN THIS PRACTICE ARE LIGHT CHANTING, DYNAMIC MOVEMENT WITH BREATH, SHORT MEDITATIONS, LONG HOLD (YIN) POSTURES, AND SAVASANA. VIMANA HOT YIN IS BOTH A GENTLE, AND CHALLENGING YOGA PRACTICE. AFTER A GENTLE PRANAYAMA, PASSIVE POSES ARE HELD FOR 3-5 MINUTES IN ORDER TO ACCESS THE CONNECTIVE TISSUES, TENDONS, FACIA, AND LIGAMENTS AT A DEEPER LEVEL. THIS NOT ONLY IMPROVES FLEXIBILITY, BUT THE FLOW OF PRANA. A MORE MEDITATIVE APPROACH TO YOGA, YIN AIMS TO CULTIVATE AWARENESS OF ONE’S INNER SILENCE, QUIETING THE MIND, AND BRINGING TO LIGHT A UNIVERSAL, INTERCONNECTING QUALITY. For those of you that need more plyometrics, and to shake it out…Buddhi yoga also helps to develop buddhi and unites the mind with the higher Consciousness. Developing the spiritual mind, refining consciousness and succeeding in merging with primordial Consciousness are the directions of Buddhi yoga.